So you have heard yoga is good for you. Perhaps you have heard yoga is only for flexible people. Or for hippies. Maybe for bored housewives. Indeed, it’s all of that and much more. Yoga is for everybody. And for every body. If you can breathe you can do yoga, in one form or another. And we can definitely all benefit from it. But what then, you may ask, is yoga exactly? Well, here is a (very, very) short explanation going beyond the standard “exercises on the mat” reputation it has. The practice of Yoga originated in India and the word itself translates from Sanskrit as “union”. Although open to many interpretations, it is often referred to as the union between the “Individual” and the “Universe” or between the “Body, Mind and Soul”. To attain this union, in other words to become enlightened and achieve liberation, several paths have developed throughout the millennia. Altar in our yoga shala in Bali. Different gods, different gurus, different practices. Have you ever heard of Mother Theresa, the catholic nun who dedicated years of her life to the poor and sick in India? You could say that she was a true practitioner of Karma Yoga. She chose the path of selfless service. Enlightenment can be achieved by this kind of dedication. Perhaps you already practice yoga, without realising it, such as volunteering or charity work. Especially if you do it as an act of pure selflessness without expecting anything in return, not even gratefulness from those you help, then you are indeed a yogi. Two other paths of yoga are Jnana Yoga and Bhakti Yoga. Jnana yoga practitioners are the intellectuals. They use their will and power of discrimination to cut through the veil of ignorance and attain the Truth. They study ancient texts and scriptures and also practice mental techniques of self-questioning and deep reflection in order to find the Truth. Through Truth, achieve liberation. Bhakti yogis are the emotional ones. They follow the path of love and devotion. They chose a spiritual practice focused on loving devotion towards one or more gods. 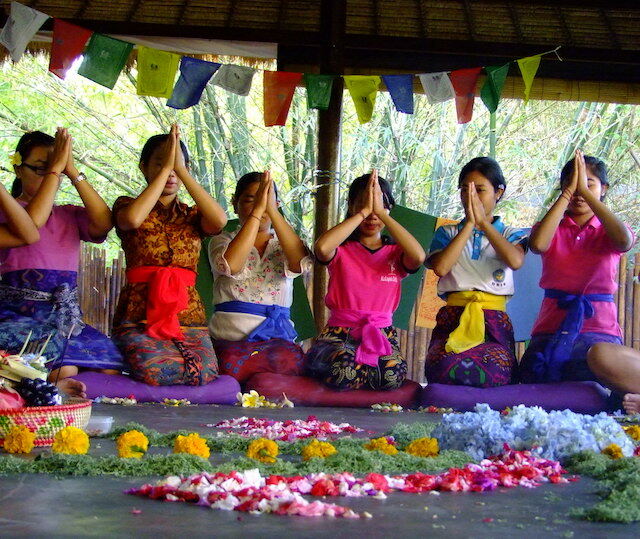 Are you familiar with all those offering rituals and ceremonies in Bali? That’s a form of bhakti yoga. I might get to explain all of these limbs to you in subsequent blogs, but for now, did you notice the one in bold? That is the limb we nowadays generally refer to as yoga: the asana practice, the physical practice of yoga postures. The purpose of asana practice is to purify the body, to free it of dis-eases or anything that could make you feel uncomfortable when you try to sit still to meditate. Because hey, you need to meditate for hours on end in order to achieve self-control, right? Meditation practice during our yoga teacher training in Bali. The warriors, the tree poses, the lotus poses: these are asanas, physical yoga postures. Perhaps that is what you have been told yoga is. Sweating on the mat, trying to touch your toes. Indeed, that could be part of your yoga practice, although the practice would be in the “trying to touch” rather than in the “touch your toes” bit. But as you have gathered by now, yoga is much more than that. Yoga is about physical wellbeing, absolutely, but also about mental strength, emotional balance and spiritual peace. About mindfully connecting to the world around us and about knowing how to surrender without fatalism, about being disciplined without being dogmatic. Furthermore, practicing yoga can make you more focussed, help you get rid of anxiety, improve your mobility, improve your outlook on life… I could go on and on, but you probably already think I’m getting carried away. Concluding, yoga can definitely be beneficial, whether you are a bored housewife or a hippie. And everything in between. Come check us out in at Coconut Yoga Bali in Amed, Bali or at Yoga Here & There in the Fleurieu Peninsula, South Australia for daily asana classes. To learn more than just about the physical practice, have a look at our 200-hour Teacher Training Course, which is great for those who already know they want to teach and also for those who simply wish to deepen their knowledge about yoga. YouTube yoga, yes or no? What Style of Yoga Should I Practice? Practicing Yoga with a Frozen Shoulder.